All the useful information that you need to know before sending money with TransferWise! Launched in the year 2011, TransferWise was inspired by the personal experience of its founders. It claims that it does not skew exchange rates for making profits as banks. TransferWise does not transfer the sender’s money directly to the recipient. It matches the accounts with other TransferWise’s customer sending the money another way. Then it pools the funds to pay out transfers at the local bank accounts. This shows that the money never actually cross the borders or converted into another currency. So, it avoids pricey international payments completely by using two local transfers instead of one international transaction. TransferWise online money transfer provides comparable exchange rates to its customers, where it supports more than 750 currency routes. The service fee charged by it for online money transfer is up to 0.6% of the total amount transferred. The maximum amount that one can send through TransferWise is $50,000 per day and $250,000 per year for the private use. It also offers business transfers, where one can transfer up to $250,000 per day and $1,000,000 per year. TransferWise offers remittance services to its users through the bank account, debit and credit card. It does not provide any pickup or courier services, so the amount you have transferred will be deposited in the bank account of the recipient. It does not have 24*7 customer care services, but one can send email to the company for the issues one is facing. It has also provided customer care numbers for different countries, which you can find here. The customers can contact them in their working hours provided with the TransferWise phone number. TransferWise is highly secured, where experts monitor the unusual behaviour. Any payment done through it gets encrypted using Transport Layer Security technology. Pricing : How much does TransferWise cost? TransferWise is a large platform with its customer base of 4 million, who collectively transfer around $4 billion per month. TransferWise online money transfer offers better transfer rates than many of the banks and competitors. It keeps updating the rates and offers live prices of mid-market which align with the global markets. TransferWise fee ranges between free to $4, which is fixed price on every transaction. Besides this, there is a small percent of the fee that is charged on the amount you are transferring, which ranges in between 0.4 to 0.6 percent. This all depends on the mode of sending money, i.e., bank account transfer, debit card or credit card transfer. For more understanding of the fees structure of your transfer, it has provided TransferWise Calculator where you can see the charges you need to pay and amount that will be received by the recipient. Transparency: Does TransferWise have any hidden fees? Whenever one send money using TransferWise, the transaction will be made on the real, mid-market exchange price. However, many banks don’t offer this rate to retail customers, and they add few amounts to keep up with themselves as commission. But, the TransferWise update the rate when you entered the amount and locked it until the transaction has been completed. The fees it charges from you will also be shown by it clearly in the transaction process as you select the mode of transfer, yours’ as well as recipient’s currency. So, it does not attract any hidden fees and very much transparent with its transfers. You can also track the transaction that you have completed with TransferWise through the order number or reference number provided by it with every transfer. It shows how long it may take to reach the amount to the recipient. Customers from Canada, Australia and the UK can also send the money through Facebook Messenger using the TransferWise services. Transfer Speed: How long does it take to send money through TransferWise? TransferWise has variable transfer speed according to the type and mode of transfer. If you are sending money through the card, it will go instantly, while if you are transferring funds through a bank, it may take longer. The company completes almost 90% of its transfers within 1-2 working days. It also offers SWIFT Payment which is sent via the SWIFT international payment network. This takes at least 1-3 working days to reach to the recipient and sometimes more when many intermediary banks are involved in the transaction. If you are transferring funds from GBP, then the company offers Low Cost Transfer and Fast & Easy Transfers. Here the speed of your transfer depends on the type you choose for making a transaction. Besides this, it can handle the money to the bank in normal working hours only, so it also depends on the country where you are sending the money. TransferWise wire transfer takes one working day to transfer funds in the bank account. It also offers TransferWise Borderless account which helps you to send, receive and spend money around the world in more than 40 currencies. This is 8X cheaper than the banks and does not attract fees till spending $200. The customer can send large amount in once, either private or business, so TransferWise is a wise option to send money with low cost. Security : Is TransferWise Safe? It is very much essential to know how much your online transactions are safe and does it affect your privacy? Then it is good news for you that TransferWise is highly secured and has amassed a large customer base in the past years. It is fully regulated by the Financial Conduct Authority (FCA), which aims to make sure that financial markets are run with integrity, so customers get a fair deal. To maintain financial integrity, TransferWise keeps their customer’s money separate from their own operating accounts. It has also made the customer security as the priority and protected the details from prying eyes using HTTPS security encryption. We believe that it has a high digital security like many banks but there is no physical security, so here TransferWise deserves 8 out of 10. TransferWise is a highly user-oriented website. You will find many FAQs on its website which will clear all your doubts before you send your funds. TransferWise money transfer also offers mobile apps for the customer, so that one transfer money anywhere anytime without any delay. You can download TransferWise apps here (Android App and iOS App). You need not log in for checking out the TransferWise transfer rates. When it comes to customer support, TransferWise contact details are provided for various countries on its website. It does not offer 24/7 customer support, but you can send the mail to them here. It also provides email and SMS services for their transaction details to its customers. About payment convenience, it accepts various debit and credit cards, helps you in transferring funds through Facebook Messenger, and bank accounts. However, it does not support money market instruments, crypto currencies and savings accounts. So, customers who hold these instruments cannot use the services of TransferWise. It also does not offer cash pickup or courier services, so, there is no home delivery of your cash to the recipient. It will only place in the bank account of the recipient. As per user experience, we rate 8 out of 10 to TransferWise support services. It’s because customers are not satisfied with its assistance facilities. We would have given it a higher score if the users have clear indications and understanding of their transactions. 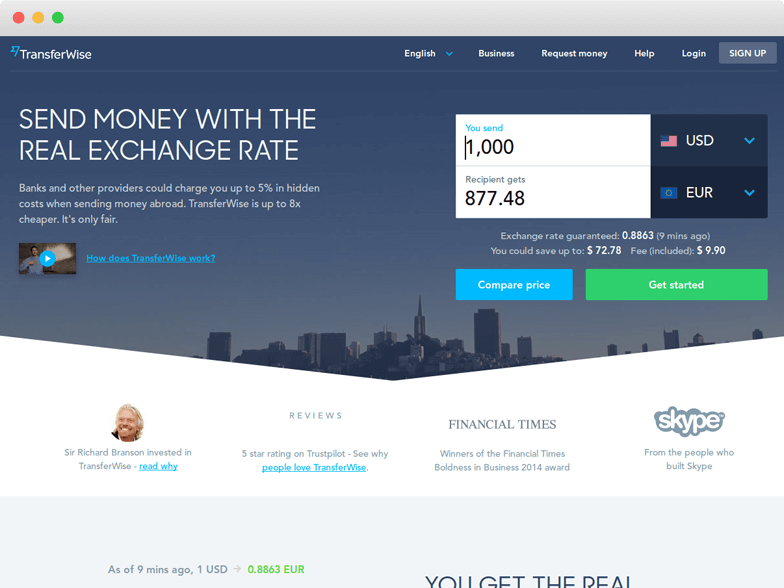 Coverage: How many Countries & Currencies does TransferWise support? Very good for transportation itself. Thanks! But I don't know why my driver license could not be used for the identification although the web site says that it is acceptable. I was just suggested to submit another one. Really quality and fast service. Excellent system, i like all de plataform!! FAST SERVICE, Very well..!! Some money sent arrives too slow. I don't understand because out of 5 transactions, 3 went through immediately and 2 are going to arrive after 3 days. They were sent to the same address. Incredibly quick and helpful response by TransferWise team member when I called customer support. Thanks! Transaction was fast and without problems, the friction was more at the beginning to set-up the appropriate way of payment. Next time being much easier. 3 seconds transfer ? I am from Saudi Arabia i paid 8400 GBP from my Transferwise to a UK business and transfer done in only 3 seconds. Unreal and even faster than Paypal. Impressed! I am very happy with Transferwise so far. I have their debit card, which even arrived ahead of schedule, I can top up my account with multiple options, most importantly including credit card and bank transfer and the app and desktop interface both look very sleek. Go to the website of TransferWise Money Transfer. Enter the amount that you need to transfer on the “Send Money” option on the home page. You will be redirected to a new page, where the company will ask you the details of login or sign up. Select the type of transfer, personal or business and log in using Google, Facebook or manually entering the details. You need to enter the name, phone number and many other personal details including a personal ID for the security purpose. Enter the recipient details and re-check it. TransferWise will provide you with an order number, which will help you in tracking the transaction details.